The most memorable season in Wisconsin basketball history fell one win short. The Badgers led by 9 with just over 13-minutes to play against Duke, but the Blue Devils went on a 10-0 run and closed out a 68-63 victory over the Badgers to win their 5th National Championship. The Badgers had the most difficult road, beating teams like Oregon, North Carolina, Arizona and Kentucky in the NCAA Tournament. But even after falling to Duke way back in December at the Big Ten/ACC Challenge, the Badgers couldn’t return the favor in last night’s NCAA Championship game. Four seniors, Frank Kaminsky, Josh Gasser, Traevon Jackson and Duje Dukan, played their final games for the Badgers. Junior forward Sam Dekker hasn’t announced whether or not he’ll be back next season. The 6th-ranked Wisconsin Badgers had already wrapped up the Big Ten regular season title and the number-1 seed in the Big Ten tournament. But they still had one game left to play and coach Bo Ryan said the mission was to head back to Madison with a win. Mission Accomplished! The Badgers rolled to 72-48 win over the Ohio State Buckeyes on Senior Day in Columbus, Ohio. 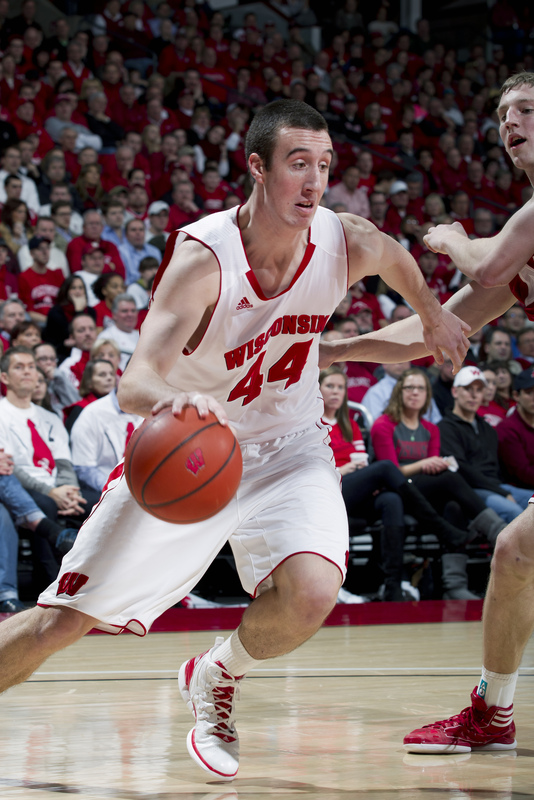 Senior center Frank Kaminsky sat most of the first half with two fouls and three points. He made up for lost time in the second half, scoring 14 points to finish with 17 points and 8 rebounds, leading the 2nd ranked Wisconsin Badgers to a 69-56 win over Oklahoma in the Battle 4 Atlantis championship game in Paradise Island, Bahamas. Kaminsky led four starters and reserve Duje Dukan in double figures as the Badgers improved to 7-0 to start the season. Traevon Jackson added 13 points, eight assists and three steals. Sam Dekker added 11 points and Nigel Hayes 10 points and 7 rebounds. Dukan came off the bench to score 13 points. After trailing by 1, 34-33 at the half, Oklahoma shot just 29% in the second half. The Badgers get a few days off before facing Duke in the Big Ten/ACC Challenge next Wednesday. The 2nd-ranked Wisconsin Badgers wiped out a 53-44 second half deficit and pulled out a 68-65 win over the Georgetown Hoyas in the semifinals of the Battle 4 Atlantis. Sophomore forward Nigel Hayes tipped in a miss by Traevon Jackson with 20 seconds left to put the Badgers up by three and D’Vauntes Rivera-Smith misfired on a three-pointer that would have forced overtime. Sam Dekker scored 17 points, Hayes added 15 points and seven rebounds and Bronson Koenig came off the bench to scored 14 points (2 of 4 three pointers and 6 of 10 shots overall) for the Badgers. Duje Dukan also added eight points off the bench to help the Badgers in their second half comeback. Frank Kaminsky hit just 1 of 8 from the field and finished with a season-low six points. The Badgers also had 14 turnovers, six more than their season average. 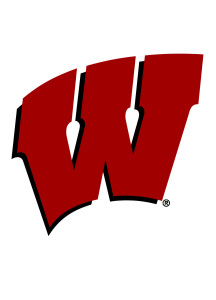 Wisconsin (6-0) faces Oklahoma (4-1) at 3:30pm (ESPN) in today’s title game. 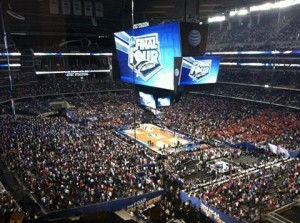 Oklahoma finished off Butler 59-46 in the other semifinal. The 2nd ranked Wisconsin Badgers shot 56% from the field and cruised to a 72-43 win over UAB in the opening round of the Battle 4 Atlantis on Wednesday night in Paradise Island, Bahamas. 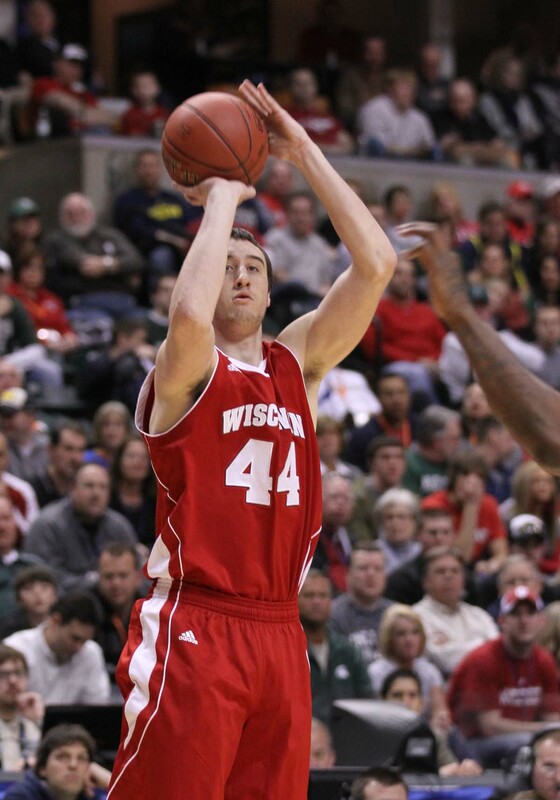 The Badgers got 16 points, 8 rebounds, three blocks and three assists from center Frank Kaminsky. Duje Dukan nad 11 points and Josh Gasser 10 to lead the Badgers. Wisconsin shot 56% from the field to improve to 5-0. The Badgers move into today’s semifinals against Georgetown at 2:30pm (ESPN). The Hoyas knocked off No. 18 Florida 66-65 in overtime. The first semifinal of the day features a pair of unranked teams, Butler (4-0) vs. Oklahoma (3-1). Butler advanced by beating No. 5 North Carolina 74-66 and Oklahoma knocked off No. 22 UCLA 75-66. Successful on the court and in the classroom this past season, Wisconsin Badger stars Frank Kaminsky and Duje Dukan were named to the 2013-14 NABC Honors Court, announced by the National Association of Basketball Coaches today (Monday). In order to be named to the Honors Court, student-athletes must meet a high standard of academic criteria, which includes a cumulative grade-point average of 3.2 or higher. Kaminsky started all 38 games for the Badgers and averaged a team-best 13.9 pints and 6.3 rebounds per game last season. The senior from Lisle, Illinois, was named NCAA West Region Most Outstanding Player after leading UW to its first Final Four since 2000. Dukan appeared in all 38 games last season, averaging 8.1 minutes as a reserve and 2.8 points and 1.5 rebounds a game. The redshirt senior from Deerfield, Illinois, averaged 4.0 points a game during the NCAA tournament, including an 8-point, 5-rebound performance against Kentucky in the Final Four. The NABC will announce its Team Academic Excellence Awards on Wednesday. matchup against Michigan to give the Wildcats a 75-72 win over the Wolverines. Saturday night, Harrison did it again, this time with Kentucky trailing Wisconsin by two points. His three gave the Wildcats a 1-point lead with 5.7 seconds left to play and an eventual 74-73 victory over the Badgers and a spot in Monday night’s championship game against Connecticut. The Badgers had a chance to win it after a timeout. The inbound pass went to Traevon Jackson who rushed up court and got a shot off from about 17 feet on the left-wing. It was just off the mark and sent the Wildcats into celebration mode. For the Badgers (30-8), their dream of an NCAA Championship was gone. They struggled stopping Kentucky when the Wildcats took the ball to the basket. They gave up penetration and then second chances. Yet Wisconsin was right in the thick of things. Wisconsin led much of the way, thanks to near perfect free throw shooting (19-20) and the solid bench contributions from freshman Bronson Koenig (11 pts) and junior forward Duje Dukan (8 pts). Koenig’s play was especially big when Traevon Jackson picked up his second foul with nearly 12-minutes left in the first half. Koenig played the rest of the first half and more than held his own against the high-flying Kentucky Wildcats. James Young scored 17 points and Julius Randle 16 for Kentucky (29-10). Sam Dekker and Ben Brust had 15 points each to lead the Badgers. Junior forward Frank Kaminsky was held to two points in the first half, but the rest of the Badger rotation picked up the slack. Wisconsin took a 40-36 lead into the locker room at halftime. After Sam Dekker opened the second half with a three-pointer to give the Badgers a 43-36 lead, Kentucky went on a 15-0 run. It was literally the only point in the game where Kentucky’s bigger, stronger interior players looked as if they would take over and not give in. 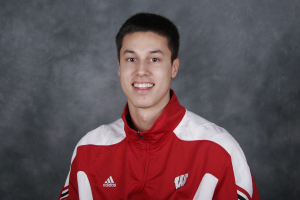 But the Badgers answered with a 15-4 run of their own, led by the play of Duje Dukan. Wisconsin had a couple of costly turnovers down the stretch and it may have prevented them from being the team getting ready to face U-Conn on Monday night. But Wisconsin’s run will still be one that will be remembered. And with Ben Brust being the only significant contributor that will depart because of graduation, Badger fans are already looking forward to seeing what Bo Ryan and company can do next season. The future certainly looks bright. Sam Dekker scored 20 points to lead five players in double figures on Thursday night, leading the Wisconsin Badgers to a 101-92 exhibition victory over Ottawa University in Ottawa. Dekker hit 9 of 11 from the field, grabbed eight rebounds and added seven assists. Ben Brust added 18 points and hit 5 of 9 from three-point range. The Badgers as a team hit 15 of 26 from distance. George Marshall added 15 points, Duje Dukan 14 points and Frank Kaminsky 12 points in the win.